If you ever thought it would be cool to have your home powered by solar, now you have a great opportunity to make that a reality. 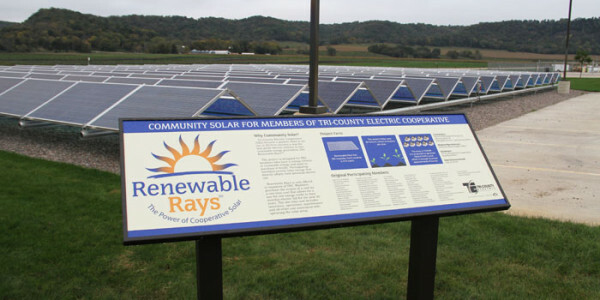 TEC’s community solar project, Renewable Rays, consists of 180, 410-watt units that are being offered to members of the cooperative. Members can purchase the output of a unit for a one-time cost of $1,400 that will allow a one-for-one credit from the output of the community solar project to the member’s monthly electric bill for the next 20 years. It locks in your renewable energy that will hedge your electric costs for the next 20 years. The unit output cost includes insurance, operations, maintenance and all other costs associated with operating the community solar project over 20 years. The 73 kW project will be located at TEC’s headquarters in Rushford. The project is designed NOT to be subsidized by members not participating in the project. TEC is also pleased to report that its community solar model is being used by electric cooperatives all across the United States and implemented through the National Renewables Cooperative Organization. Why is TEC building community solar? What is the purpose of Renewable Rays? Do I have to be a TEC member to participate? What size is the solar array and where is it located? How much energy will the solar array produce? How do I participate in the Renewable Rays community solar program? How do I receive payment for participating in the program? Am I responsible for any future costs to maintain the solar system? How long could I receive benefits from Renewable Rays? By participating, do I own part of Renewable Rays? Can I participate if I already have my own distributed generation system? What if I transfer or cancel my TEC account? How do I sign up to participate in Renewable Rays? There has been significant interest by TEC members for a cooperative-owned source for renewable energy. 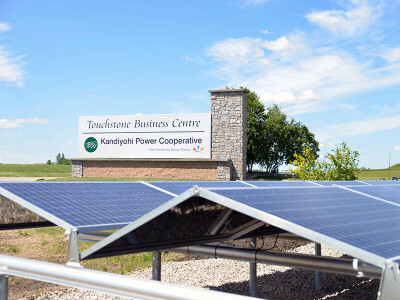 It provides TEC members with an affordable option to acquire locally produced renewable energy. Yes, to be eligible you must be a TEC member in good standing with an active electric account. 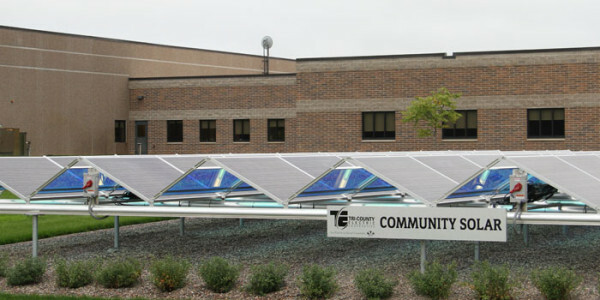 It is a 73.8 kilowatt (kW) array located at the TEC headquarters facility. Energy production will vary from month to month and year to year based on how much the sun shines. Estimated annual production in the range of 105,000 – 107,000 kWh is expected. This results in approximately 50 kWh per unit per month on an annual basis. You must sign a membership agreement and make a one-time payment (no additional fees) for a unit(s) in the amount of $1,400.00 per unit. Payment by check is due at time of sign up. A unit is a designated amount of energy producing capacity. 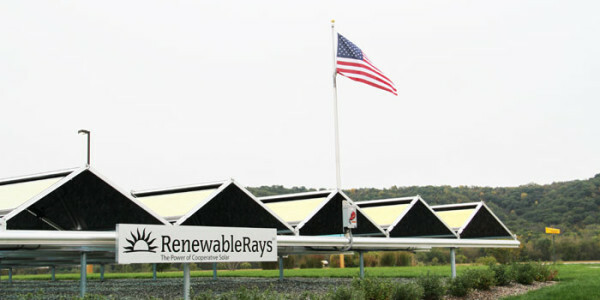 Renewable Rays is made up of 180 units. Participating members purchase the energy output from the unit(s). Each month the energy produced by the solar array will be measured and the total divided by 180 (units). Each participating member’s account is credited the kilowatt-hours (kWh) for each unit they own, in effect lowering the monthly electric bill by the amount of renewable energy produced per unit. No, TEC agrees to own, operate, maintain and provide insurance for solar array for the duration of the program. The term of the program is 20 years. No, members are purchasing the capacity to produce renewable energy, not the hardware or components of the actual solar array. There are no rebates or tax benefits for participation. It depends on how much of your monthly energy use is already provided by your system. The benefit you receive from Renewable Rays is in the form of a monthly kWh bill credit. Members will need to make sure they can use the credit to offset their energy use because there is no cash payment for the energy credit. In the event that a member closes their account, they may request that their unit(s) be transferred to another of their accounts, to another TEC member or be repurchased by TEC. Interested members may contact Ted Kjos, V.P. of Marketing / External Relations (507-864-9232 or tkjos@tec.coop) to obtain additional information and a Renewable Rays membership agreement.